Preferred Airparts, LLC - New Surplus and Used Aircraft Parts. In Memory of Ken Stoltzfus Jr. Some who visit this site might not be aware of the July 19, 2011 passing of Ken Stoltzfus, Jr.. Ken played a key role in building Preferred Airparts, and in establishing Priority Air Charter and AFM Hardware with his brother Brian. Here are some details and thoughts on Ken's life, and his death. Ken Stoltzfus Jr. was born Sept. 17, 1960, in Coatesville, PA, to Ken and Elaine Stoltzfus. He shared deeply in life with younger brothers Brian and Mark. in the footsteps of his grandfather, the late Chris D. Stoltzfus of Coatesville, PA, and his father Ken Stoltzfus (Sr.). 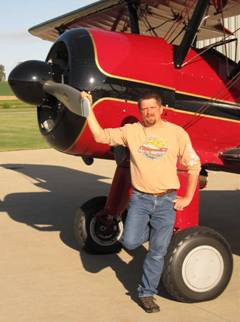 In August 1982 he and his brother Brian joined their dad in founding Preferred Airparts in Kidron, OH. Their dad handed the business off to them in 1985 and Ken played a major role in its growth. his focus on things that mattered in the big picture. Ken’s first surgery for brain tumors was at the Cleveland Clinic in December 2004, followed by July 2010 and April 2011 at other locations. Uncontrollable brain swelling after emergency surgery on July 15, 2011, did irreversible damage and Ken Stoltzfus Jr. transitioned peacefully into God’s presence on July 19 from the Princeton Baptist Medical Center in Birmingham, AL. He joined his grandparents, and Sheila’s and his child lost by miscarriage. He is survived by his wife Sheila and their three children, Colby, Austin and Danae. We are so thankful for the absolute confidence that Ken is present with our Lord Jesus and that we will see him again one day.